Hey, A Jets Quarterback Controversy! Who Would've Thought? There is no quarterback controversy, Mike Tannenbaum insisted yesterday. But here's one anyway! The back cover of the Daily News trumpets Tebow gunning for Sanchez's job, but the real story is more prosaic. Sources (sources!) say that Tebow preferred New York to Jacksonville because it's more likely he could end up as a starting quarterback with the Jets. Am I a source? I could have told you that. Jacksonville wanted Tebow to be a third-string QB and feature on special teams. 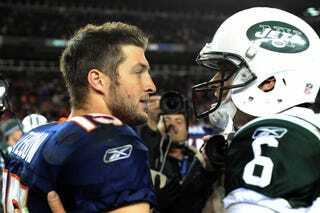 The Jets wanted Tebow to be a backup to a guy who's far from beloved, and isn't a particularly great quarterback. Which destination do you think sounded more promising. Sources? Hmm. The sources say that of course Tebow would like to be a starting quarterback in the NFL, and we're foolish for thinking otherwise. The sources go on to say that this isn't a real quarterback controversy because it's March and Tim Tebow hasn't even met with the Jets, but that it does sell newspapers, and that media quarterback controversies often have a way of turning into front office quarterback controversies. Especially when you just paid a couple million for the backup, and the backup is Tim freaking Tebow. In related dumb news, the Tebow trade is off again, temporarily. For some reason Tebow has to sign another contract with the Broncos, then be on that for 24 hours before he can officially become a Jet. So just to recap, Mark Sanchez pseudo-lost his theoretical job to a guy on another team.